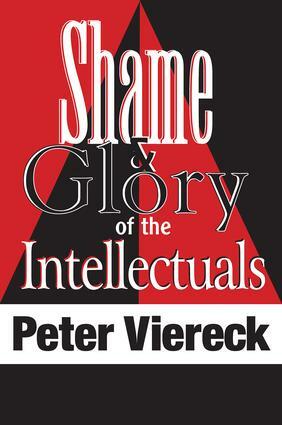 In this classic volume, written at the height of the Cold War, with a new preface of 2006, Peter Viereck, one of the foremost intellectual spokesmen of modern conservatism, examines the differing responses of American and European intellectuals to the twin threats of Nazism and Soviet communism. In so doing, he seeks to formulate a humanistic conservatism with which to counter the danger of totalitarian thought in the areas of politics, ethics, and art.The glory of the intellectuals was the firm moral stance they took against Nazism at a time when appeasement was the preferred path of many politicians; their shame lay in their failure to recognize the brutality of Stalinism to the extent of becoming apologists for or accomplices of its tyranny. In Viereck's view, this failure is rooted in an abandonment of humane values that he sees as a legacy of nineteenth-century romanticism and certain strands of modernist thought and aesthetics.Among his targets are literary obscurantism as personified by Ezra Pound, the academicization of literary culture, the rigidity of adversarial avant-gardism, and the failure of many writers and cultural institutions to conserve the very heritage their political freedom and security depend on. Viereck represents their attitude in a series of satirical dialogues with Gaylord Babbitt, son of Sinclair Lewis' embodiment of conservative philistinism. Babbitt Junior is as unreflective as his father, but the objects of his credulity are the received ideas of liberal progressivism and avant-garde mandarinism. Ultimately, Viereck's critique stands as a timely rebuke to the extremism of both left and right.